First let me thank the people that make it possible for me to race my bike:. I just got back from a weekend of EPIC climbing in the Santa Monica Mountains. 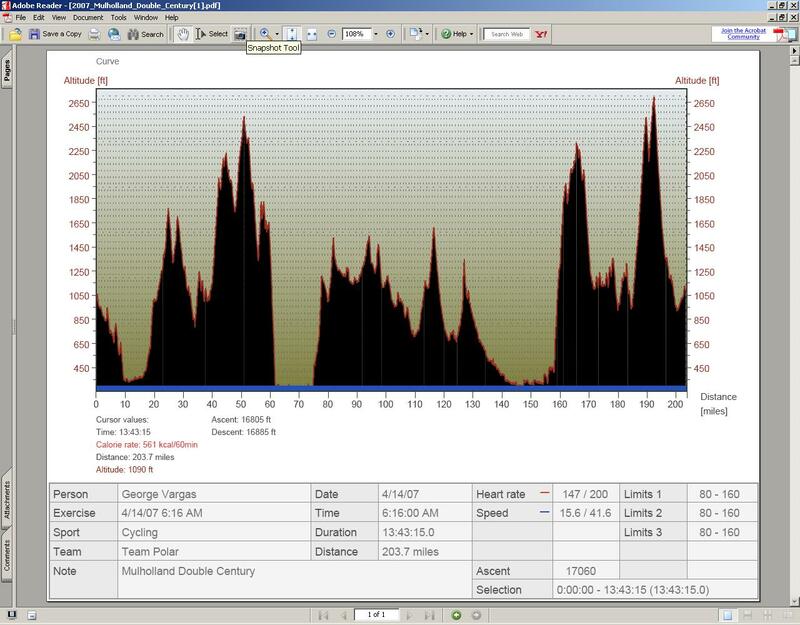 I did the Mulholland Double Century on Saturday April 14th 203.7 miles with 17,000 of climbing. On Sunday just because I was already there I did the Mulholland Century Challenge. 110 miles with 12,000 feet of climbing. I arrived in Calabasas, the race start, late Friday night. I missed a couple of turns because I was on my cell phone and trying to drive. I should’ve know better. I hate driving in Los Angeles and one missed exit can cost you 1/2 hour of travel time. I had dinner with some friends and then it was time to do bike prep. It’s ironic that I work in a bike shop and I don’t have time to work on my bike until the night before the event . There were two ride start times for the riders doing the Double Century. The first start time was 5am and the second start reserved for the faster riders, 6:15 . I elected for the 6:15 start. I believed I could ride with the lead group for a little while and then get dropped. The plan worked until Mile 40 when I dropped my water bottle and had to stop to pick it up. The lead pack just kept going. This wasn’t a bad thing. I was feeling really worked riding with the lead pack. Actually I was quite surprised to see how long the lead pack stayed together. Once I was dropped I started riding my own race. 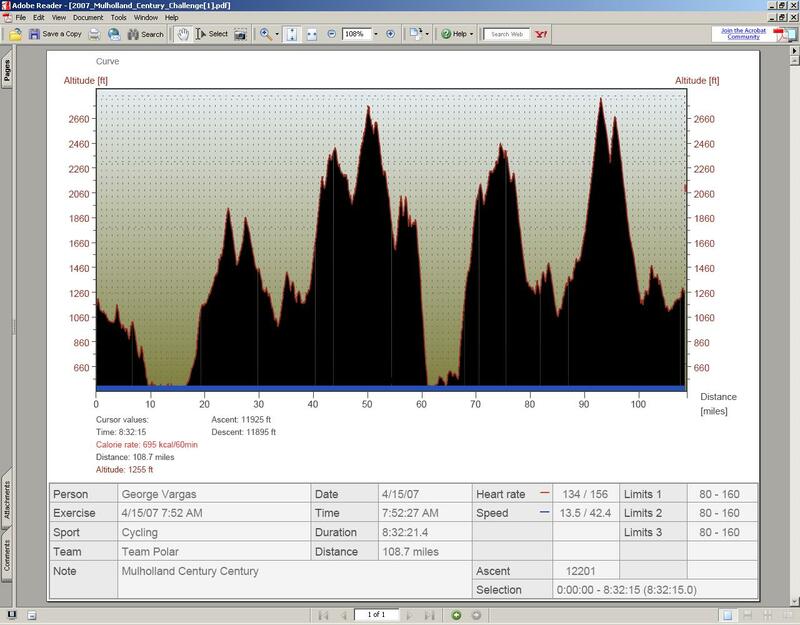 The Mulholland Double Century course is very difficult because the climbs are so steep. There aren’t any long climbs– I think the longest climb was 5 miles. I felt good all day. I stayed on top of the fueling and supplements. I knew that I faded last year after mile 150. So this year I was forcing myself to drink. It really worked because I felt great. I went liquid fuel all day and had a lull but overall it was a good event. The next day, Sunday, I did the Mulholland Century Challenge. 110 miles 12,000 feet of climbing. My challenge was getting enough calories in me on Saturday night so that I could replenish my glycogen stores and be ready to go again. I felt sluggish at the start but as the day wore on I started to get in my groove. But then as the elevation gain continued to accumulate I really just wanted to finish. I wasn’t having fun anymore. But I got through with a little, ok a lot, of help from Brandy as my lovely SAG. The hardest thing about these two events is the steepness of the grades. There really isn’t anything that is 6% that climbs for 10 miles. Many climbs are 8-10% with some being as much as 15-20% for at least a mile. I have decided not to do Devil Mountain Double because I really need to focus on training for RAAM. The round trip driving to and from San Francisco is time I could be riding my bike. Brandy made that little observation so clear to me. She’s good at that. Devil Mountain Double Century and its 18,000 feet of gain will have to wait another year. This entry was posted in Everest Challenge, Furnace Creek 508 by REV Cycling Directeur Sportif. Bookmark the permalink.